In ver 0.3.0, you can pitch some breaking balls! In order to pitch them, you should name a Ball to specific name defined in config.yml. In ver 0.2.3, Balls will not hit to (and sometimes they will avoid) torches,tripwires,and some. When Balls hit to iron fence or vines, their bounce will be much weaker than that with other blocks. Change the amount of balls in crafting at a time. I felt the crafting-cost of the Ball is a bit too expensive, so I changed the amount of balls in crafting at a time. In this version, you can get four balls every time you craft. Sorry, in ver. 0.2.0, version-number in plugin.yml is wrong. so I fixed it and add a effect of swinging when you swing Bat powerfully. New Feature: Four other balls (that has various repulsion in being hit them by a Bat) added! New Feature: Added four other ball, which has various repulsion in being hit by Bat.They has different recipe. If normal-ball fly 100 meters, under the same condition, the "highest-repulsion-ball" will fly 140, higher one will fly 120, lower one will fly 80, and lowest one will fly 60 meters. I added them to adapt this plugin to the various size of ballpark built in your server. New Feature: Now you can use Brewing-stands as batting tees! In 0.1.0, I added a new feature and fixed a bug. Fixed: throwing "Ball" by off-hand didn't work. Previous versions had a bug:when Ball landed on thin-blocks(for example, carpet), bounce of Ball didn't work well. Sorry, I found that I forgot to delete some lines to output debug logs in my 0.0.4 code. For not dirtying your server log, I recommended to update to this version. 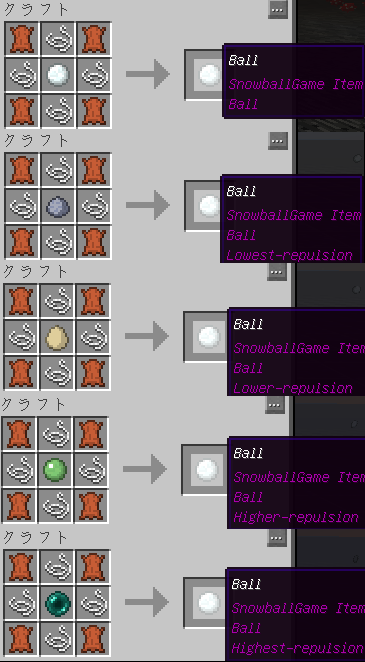 Added TAB-completions, Changed the recipe of "Ball". In version 0.0.4, you can get a full statement by tapping TAB when you are inputting SnowballGame's commands. 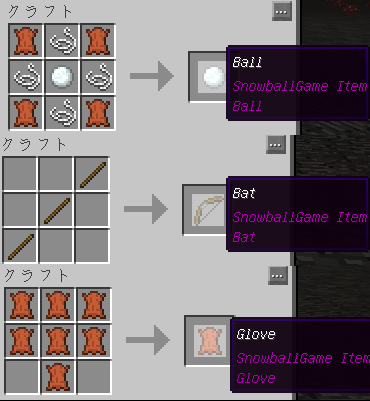 And I changed the recipe of Ball, new one requires Leather * 4, String * 4, and Snowball * 1. Improve some points to get closer to real-baseball. Improve ball speed(when slugged by Bat) and ball bound. Maybe now you can play ball game in actual-sized ballparks that you made in your world.